Bhubaneswar: Srjan, Guru Kelucharan Mohapatra Odissi Nrityabasa organised “Upasaranam: Moving towards Excellence”, an evening of Odissi Dance on July 7, 2018 at Rabindra Mandap, Bhubaneswar. It showcased Srjan’s budding talents on a major platform. The evening was inaugurated by esteemed guests, Smt. Pranati Mohanty, Dr. Ileana Citaristi and Dr. Bijay Kumar Jena. 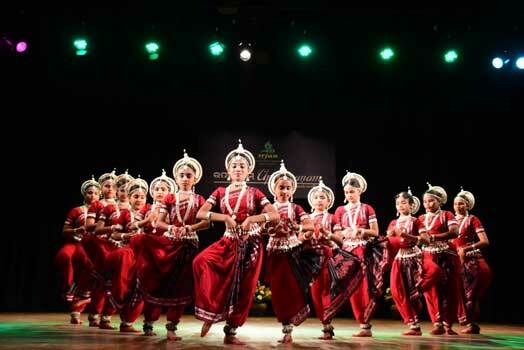 There were many exquisite dance presentations, originally choreographed by legendary Guru Kelucharan Mohapatra and Ratikant Mohapatra, Director of Srjan, which were set to group compositions by senior members of Srjan. Upasaranam commenced with the traditional invocatory item, “Mangalacharan”, with the young artists paying obeisance to Lord Jagannath and then performing a Vishnu Vandana with the Shloka, ‘Shantakaram Bhujagashayanam’ from the Vishnu Sahasranamam. The group composition was by Pragna Parimita Das and the dancers, Amrita, Anisha, Anshita, Bhabna, Gul, Himakshi, Ipsita, Monali, Ritika, Shree, Shubhashree, Shubhra, Shreya and Swikruti beautifully portrayed Lord Vishnu’s grandeur. The second performance of the evening was Guru Vandana, a salutation to the Guru, performed by the youngest dancers of Srjan, Abhisikta, Akankshya, Anwesha, Ashmita, Cariline, Chinmayee, Dishita, Sagun, Saishree, Sai Shreya, Sushree and Swati. The group composition was by Riyanka Chakrabarty. After this delightful performance, the highly technical pure dance, Batu was presented with meticulous footwork and precision by Akankhya, Amrita, Anushka, Anwesha, Bhabyaa, Bibhinnita, Dipranwita, Maitri, Manyata, Nandini, Pratikshya, Riya and Somalin, to a group composition by Sujata Pradhan. The only solo presentation of the evening was Bhagavati Stotram, portraying the power and grandeur of Goddess Durga, choreographed by Ratikant Mohapatra and set to the music composition of Satyabrata Katha. Sushree Shivangi Panigrahi, grand daughter of the timeless legend Smt. Sanjukta Panigrahi, was tastefully attired in a red saree and presented this dance with poise and maturity. As the evening progressed, so did the intricacies of the dance presentations. The next performance was a pure dance, a Pallavi, set to Raag Mohana and Triputa Taal, presented by Angelina, Ansita, Mehek, Mihika, Priti Pragyan, Sarmistha, Shilpa, Sruti Joshna, Sushree Sangita, Swostideepa to Ritu Sengupta’s composition. The finale ‘Bho Shambho’ was an energetic and brilliant delight of music and choreography. Trained by Smt. Rajshri Praharaj, dancers Dibyashree, Prajakta, Prerna, Reebdhita, Subhashree, Tanushree and Tuhin presented Bho Shambho with élan, giving a befitting end to the evening. Under the guidance and supervision of Guru Ratikanta Mohapatra and the programme executive and light designer Debi Prasad Mishra, Upasaranam lived up to its name of being a professional presentation of Odissi by Srjan’s promising talents, a tradition being carried forward every year.